guiding principles for an adaptive technology working group | Abler. I’ve been thinking about the studio/lab/workshop environment I want to foster at Olin. So herewith a manifesto, or a set of guiding principles, for young engineers and designers working critically, reflexively, in technology design and disability. 1. We use the terms “adaptive” and “assistive” technologies interchangeably when speaking casually or with newcomers to this field, but we use the terms of adaptation as often as possible. Why? Assistance usually implies linearity. A problem that needs fixing, that seeks a solution. But adaptation is flexible, rhizomatic, multi-directional. It implies a technological design that works in tandem, reciprocally, with the magnificence that is the human body in all its forms. Adaptation implies change over time. Adaptive systems might require the environment to shift, rather than the body. In short, we believe that all technology is assistive—and so we speak in terms of adaptation. 2. We presume competence. This exhortation is a central one in disability rights circles, and we proceed with it in mind as we work with our design partners. We don’t claim our end-users are “suffering from” their conditions—unless they tell us they are. We speak directly to users themselves, not to caregivers or companions—unless we’re directed to do so. We speak the way we’d speak to anyone, even if our partners don’t use verbal language in return—until they request we do otherwise. We take a capabilities approach. 3. We work in public. Doing open and public research—including in the early stages—is central to our conviction that design for disability carries with it enormous political and cultural stakes. We research transparently, and we cultivate multiple and unusual publics for the work. 4. We spend some of our time making things, and some of our time making things happen.¹ A lot of our effort is embodied in the design and prototyping process. But another significant portion of that effort is directed toward good narrative writing, documentation, event-wrangling, and networked practices. Design can be about a better mousetrap; it can also be—and indeed more often should be—a social practice. 5. We actively seek a condition of orchestrated adjacencies: in topics, scales, and methods. Some of our projects attempt to influence industry: better designs, full stop. And some of our projects address issues of culture: symbolic, expressive, and playful work that investigates normalcy and functionality. We want high-tech work right up alongside low-tech work. Cardboard at one end, and circuits and Arduino at the other. Materially and symbolically, adjacencies in real time create unusual resonances between and among projects. They expand the acceptable questions and categories of what counts as research. They force big-picture ideas to cohere with granular problem-solving. 6. We presume, always, that technology is never neutral. And accordingly, we seek to create tools for conviviality, in the sense that Ivan Illich laid out in his book of the same name. Tools that are “accessible, flexible, noncoercive.” We won’t be perfect at it, but we won’t shy away from hard questions: What will it cost? What might be unintended consequences? What have we overlooked? Like life, this version is subject to change. More on the studio/lab/workshop in this earlier post. 1. “I went from making things, to making things happen.” That’s artist Jeremy Deller on how his art practice went from objects to conditions and situations. 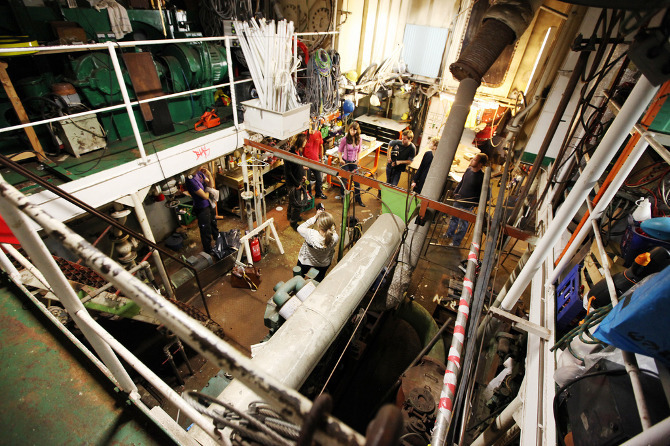 **Image: the lab-studio on a barge, at Illutron. Pingback: an alterpodium (design for one series) | Abler. Pingback: studio : lab : workshop | Abler. Pingback: the future of Abler: let me hear from you! | Abler.